Mix colors like a pro! This handy guide shows you how to mix the colors you see based on actual tube color combinations. Colors are shown utilizing a high quality printing process on a neutral gray background. The Personal size shows 18 colors and 324 hues. The Studio size shows 29 colors and 841 hues. 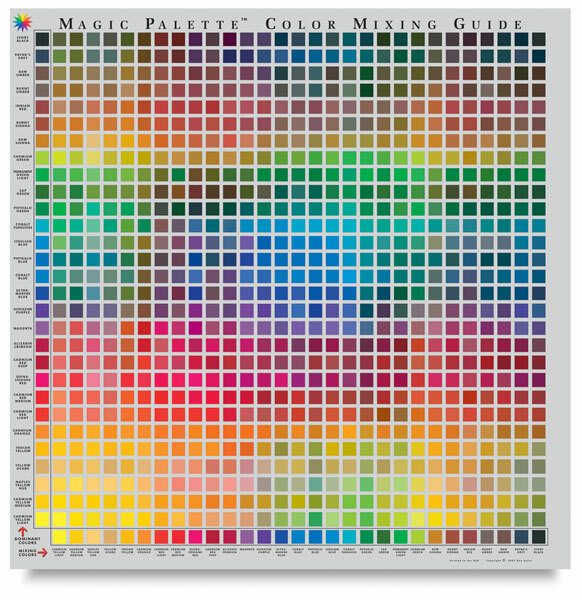 The Magic Palette is a wonderful teaching tool and an inspiring visual color reference for students. For beginners, it takes the guesswork out of mixing colors. This eliminates trial and error, and makes color selection and mixing less intimidating. For experienced artists, no matter the skill level, the Magic Palette inspires broadening of the color palette, and encourages artists to try new colors, new color families, and new color combinations. 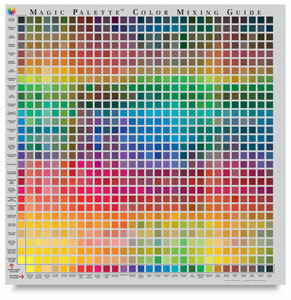 The Magic Palette is a wonderful teaching tool and an inspiring visual color reference for students. For beginners, it takes the guesswork out of mixing colors. For experienced artists, no matter the skill level, the Magic Palette inspires broadening of the color palette, and encourages artists to try new colors, new color families, and new color combinations.